A comprehensive, systematically structured research report on in vitro protein expression market by Persistence Market Research enables the reader to chalk down strategies to progress with the changing pace of the global market scenario. The research report is backed up with a unique research methodology, which presents data and statistics with high precision. The global in vitro protein expression market research report covers an in-depth market segmentation which covers all angles of the market thus giving a 3600 view delivering necessary value addition from a strategic standpoint. The research carried out for analyzing the in vitro protein expression market follows an elite research methodology that increases the accuracy percentage by reducing the deviations to a great extent. The one of its kind research methodology follows a repetitive pattern wherein each data point of every single parameter of each and every segment is evaluated multiple times and a re-validation gives a finishing touch that offers high precision with reduced errors followed by a triangulation method that raises the aspect ratio of credibility. There is no room for miscalculations due to such a streamlined and structured research process. Managed by domain experts, the analysts have crafted the in vitro protein expression market research report in such a way that it can be easily understood owing to simple yet matchless report structure. 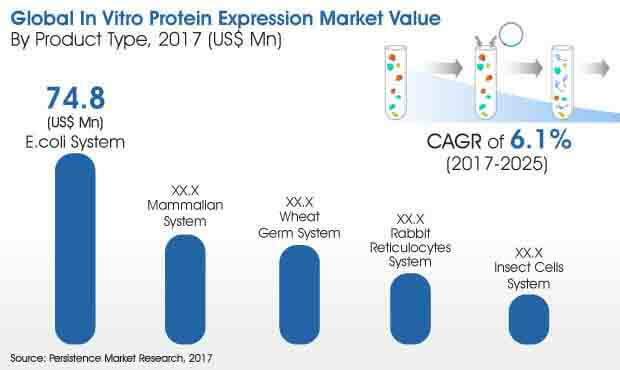 The comprehensiveness of the global in vitro protein expression market research report is due to a unique research process with which every angle present in every segment and sub-segment of the global market with respect to each sub region of all important geographies is covered, that gives a holistic touch to the research study. The reader can get a broad idea regarding implementation of marketing strategies in order to achieve informed growth in the years to come. The geographical cover up includes intelligence on important landscapes of North America, Europe, Latin America, Asia-pacific and Middle East and Africa (MEA). Several aspects are analyzed which have an impact on the in vitro protein expression market growth along with the opportunities and threats that these regions reflect. Moreover, the macroeconomic aspects, trends, drivers and challenges are also discussed in this research study. The global in vitro protein expression market research report dedicates an entire research chapter on competitive intelligence, which reflects key details of various tier companies involved in the market. The details such as company overview, product portfolio, SWOT analysis, key innovations and developments, key financial intelligence of these key players have been included in the research study. Why should you invest in this market study? The global in vitro protein expression market is anticipated to grow at a robust rate to reach a significant value by the end of the assessment period. The in vitro protein expression market has been experiencing noteworthy growth during 2012-2016 period. It is projected to grow at a value CAGR of 6.0% throughout the period of forecast to reflect a market value more than US$ 250 Mn by the end of 2025 from a market valuation of about US$ 157 Mn in 2017. This growth can be attributed towards increasing demand for continuous-exchange in vitro protein synthesis, growing consumption of in vitro protein systems in bio pharma and biotech companies, increasing demand for simple and effective protein production methods and increasing technological advancements. Strong research and development initiatives associated with in vitro protein synthesis have expanded the adoption of in vitro protein expression systems. These systems are witnessing increased use in protein library generation for customized drug development, functional genomic studies and expression of virus-like particles and in many other applications. In addition, in vitro protein expressions are potential tools used in genetic diagnostics. They can also be used in conjunction with truncated proteins as a technique in order to detect mutations in the marker genes. Moreover, the in vitro protein expression is a flexible, rapidly growing and a potent technology used in several applications. Additionally, protein labelling and gene mutation is pushing the use of in vitro protein expression market. E.coli in vitro protein expression system is widely used protein expression system owing to its cost effectiveness and higher protein yield. The E.coli system segment is estimated to be the largest with a high market valuation during the period of forecast. The E.coli system segment in 2017 reflected a valuation of about US$ 74 Mn and is anticipated to touch a market valuation a little under US$ 120 Mn by the end of the year of assessment (2025). This segment is projected to expand at a remarkable CAGR of 6.1% throughout the period of assessment. Simple and inexpensive extract preparation offered by E.coli system makes it a highly lucrative product type segment. Mammalian system segment in the product type category is expected to highly contribute to the growth of the global market. The segment reflected a value of about US$ 31 Mn in 2017 and is the second largest segment and is expected to grow at a high rate during the 2017-2025 forecast period. The insect cells system and wheat germ system segments by product type are comparatively low in valuation and are poised to register a moderate CAGR during the forecast period. Of these, the wheat germ system segment is relatively bigger than the insect cells system segment. In North America, the US being a lucrative market in the region, the in vitro protein expression market is witnessing spurring adoption, E.coli and mammalian systems being at the forefront of growth. The mammalian system in this region is expected to witness higher demand in the coming years and the segment is projected to rise at a stellar CAGR during the forecast period. The E.coli system segment in North America is projected to register a CAGR of 5.8% during the forecast period.